Some trigonometric solutions based problems on trigonometric ratios are shown here with the step-by-step explanation. 1. If sin θ = 8/17, find other trigonometric ratios of <θ. Let us draw a ∆ OMP in which ∠M = 90°. Then sin θ = MP/OP = 8/17. Let MP = 8k and OP = 17k, where k is positive. cot θ = 1/tan θ = 15/8. 2. If Cos A = 9/41, find other trigonometric ratios of ∠A. Let us draw a ∆ ABC in which ∠B = 90°. Then cos θ = AB/AC = 9/41. 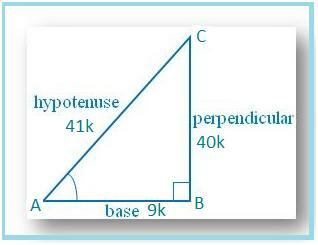 Let AB = 9k and AC = 41k, where k is positive. cot A = 1/tan A = 9/40. 3. Show that the value of sin θ and cos θ cannot be more than 1. We know, in a right angle triangle the hypotenuse is the longest side. sin θ = perpendicular/hypotenuse = MP/OP < 1 since perpendicular cannot be greater than hypotenuse; sin θ cannot be more than 1. 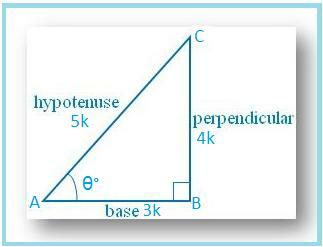 Similarly, cos θ = base/hypotenuse = OM/OP < 1 since base cannot be greater than hypotenuse; cos θ cannot be more than 1. 4. Is that possible when A and B be acute angles, sin A = 0.3 and cos B = 0.7? 5. If 0° ≤ A ≤ 90° can sin A = 0.4 and cos A = 0.5 be possible? (0.4)2 + (0.5)2 = 0.41 which is ≠ 1, sin A = 0.4 and cos A = 0.5 cannot be possible. 6. If sin θ = 1/2, show that (3cos θ - 4 cos3 θ) =0. Hence, (3cos θ - 4 cos<sup>3</sup> θ) = 0. 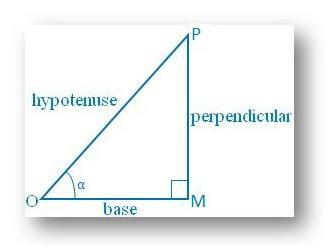 = (perpendicular + base)/hypotenuse, which is > 1, Since we know that the sum of two sides of a triangle is always greater than the third side. Then cos θ = AB/AC = 3/5. Let AB = 3k and AC = 5k, where k is positive. 9. Express 1 + 2 sin A cos A as a perfect square. 10. If sin A + cos A = 7/5 and sin A cos A =12/25, find the values of sin A and cos A.
or, sin θ =4/5, cos θ = 3/5. 11. If 3 tan θ = 4, evaluate (3sin θ + 2 cos θ)/(3sin θ - 2cos θ). 12. If (sec θ + tan θ)/(sec θ - tan θ) = 209/79, find the value of θ. ⇒ sin θ = 65/144. 13. If 5 cot θ = 3, find the value of (5 sin θ - 3 cos θ)/(4 sin θ + 3 cos θ).